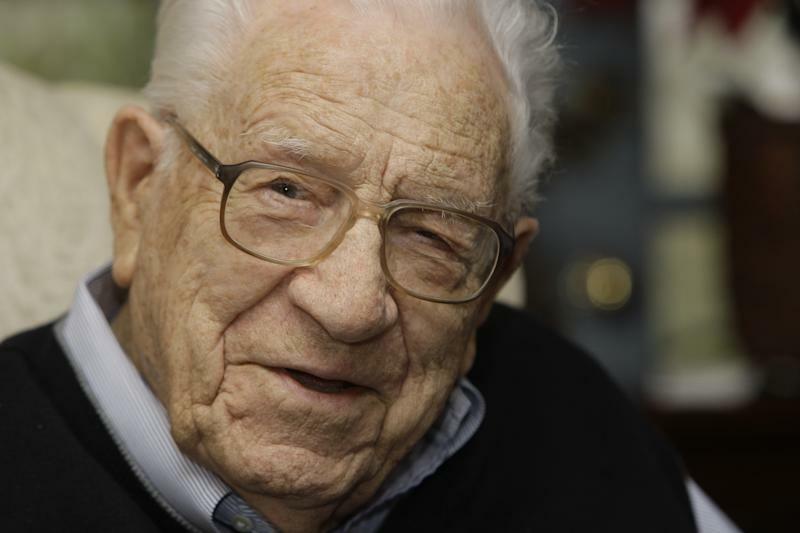 MONTREAT, N.C. (AP) — George Beverly Shea, whose booming baritone voice echoed through stadiums, squares and souls during a decades-long career with evangelist Billy Graham, died Tuesday. He was 104. Billy Graham Evangelistic Association spokesman Brent Rinehart said Shea died in Asheville after a brief illness. Shea's rendition of "How Great Thou Art" came to define the faith of a Protestant generation that Graham helped bring to Jesus Christ. He performed live before an estimated 200 million people at crusades over the years — taking him from North Dakota to North Korea and beyond. He joined Graham's crusade team in 1947 and stayed until Graham's declining health ended most of the evangelist's public appearances nearly 60 years later. "As a young man starting my ministry, I asked Bev if he would join me," Graham said then. "He said yes and for over 60 years we had the privilege of ministering together across the country and around the world. Bev was one of the most humble, gracious men I have ever known and one of my closest friends. I loved him as a brother." A Canadian emigrant who became one of America's most-recognized gospel soloists, Shea himself summed up his career with one of his inspirational trademarks: "The Wonder of It All." "I just thought it was such a privilege," Shea said in a January 2009 interview. Despite several chances to perform on the secular stage, Shea largely stuck with gospel music. He recorded dozens of albums of sacred music and was nominated for 10 Grammys. He won in 1965 for his album "Southland Favorites." At age 88, he recorded his first country-and-western album. Shea believed the simplicity of old hymns drew people to his music. "It's the message of the lyrics, the test that hits the heart in a hurry and the melody that goes along with it and seems to all go together," Shea said. Born Feb. 1, 1909, in Winchester, Ontario, George Beverly Shea grew up singing around the family dinner table and then later in his father's church choir. Though his father was a Wesleyan minister, Shea recalled that he was a wandering teenager who needed direction. He had wavered several times from the gospel until the week his father put on a special effort to draw people to the faith. When the invitation came, the gospel song "Just As I Am" — a tune that he himself later sang and recorded — filled the sanctuary. His father left the pulpit and walked to the back pew where Shea said, putting his hand on his shoulder and saying, "son, tonight might be the night." "I love my Dad. I walked with him right down that middle aisle," Shea recalled. "My father always knelt on one knee, so I knelt on one knee. That's when it happened." With more drive and focus, Shea moved to New York City and trained with voice coaches, singing on radio stations WMCA and WHN. Though he had a chance to work in the secular business, Shea instead chose to move to Chicago, where he built his popularity at radio station WMBI and later on ABC radio's "Club Time." So he was already well-known in Christian music circles even before he met Graham when the lanky young man, then a student at Wheaton College in Wheaton, Ill., came to the WMBI studio in Chicago in the early 1940s. "I knew he was from the South. I could hear it in my ears," Shea recalled. "He was what I call a Southern gentleman. He was just too complimentary of what he was hearing on the air." Their friendship began with that first handshake. "I said: 'The only gospel singers I've ever heard of, they have to sing a little bit and then talk for a while, would I have to do that?'" Shea recalled. "I hope not," was Graham's response. A few years later, in 1947, the two began their crusade ministry. Shea always performed a peaceful hymn just before the famed evangelist preached his message and asked people to make Jesus their personal savior. Graham "really loves the quiet song before he speaks. Perhaps something that will point to what he's going to speak on," Shea said. Kurt Kaiser, Shea's accompanist of 30 years, recalled his personal touch. "When he begins to sing a song, he can sing it directly to you. He tried to find a single face in the audience, maybe a sympathetic gaze," Kaiser once said. "This personal quality is same thing that can be found in the gospel message." The soloist had two children from his marriage to his first wife, Erma, who died in 1976. Shea and his second wife, Karlene, lived in Montreat.